How’s the Harbour going? A brief update. If you have been wondering if Belmore Basin will be open for Christmas the council say they are anticipating that the harbour will be open, up and running for locals and tourists. Belmore Basin project manager Lance Hazell says “weather is a constant variable” as it takes two to three weeks for the turf to settle, ready for the thousands of people expected to visit the area. “Timing is necessary to ensure the turf survives the number of people we anticipate will visit the area”. 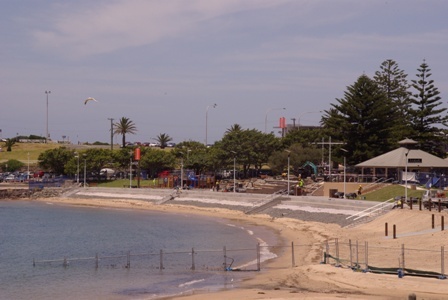 The council are expecting more than 70 000 people to visit the site over January with the harbour being a popular place for New Years and Australia Day celebrations. Let us know what you think of the new sea wall or the childrens pirate playground; Leave a comment.